Tuesday • March 11 • 2014 Volume 81 • Number 10 INSIDE: Presorted Standard US Postage Paid Permit #8 ECRWSS Vermillion, SD Menards n Bomgaars n Campbells n Sears n Dining n One In A VerMillion n bp Broadcaster Press Postal Patron Local Since 1934 201 W. Cherry n Vermillion, SD 57069 n Phone: 605-624-4429 n Fax: 605-624-2696 n www.broadcasteronline.com Mark’s Machinery Inc. March Parts Sale!! 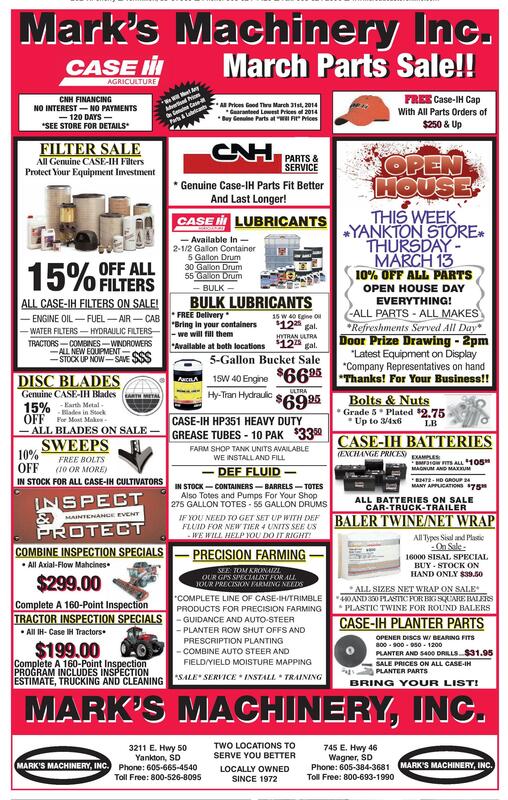 CNH FINANCING NO INTEREST — NO PAYMENTS — 120 DAYS — *SEE STORE FOR DETAILS* Any eet ill M Prices H W * We ertised Case-I Adv nuine ricants e b On G ts & Lu r Pa FREE Case-IH Cap With All Parts Orders of $250 & Up * All Prices Good Thru March 31st, 2014 * Guaranteed Lowest Prices of 2014 * Buy Genuine Parts at “Will Fit” Prices 1 FILTER SALE All Genuine CASE-IH Filters Protect Your Equipment Investment * Genuine Case-IH Parts Fit Better And Last Longer! LUBRICANTS 15% OFF ALL FILTERS ALL CASE-IH FILTERS ON SALE! –– ENGINE OIL –– FUEL F I LAIR –– CAB –– T E R S ! –– WATER FILTERS –– HYDRAULIC FILTERS–– TRACTORS –– COMBINES –– WINDROWERS –– ALL NEW EQUIPMENT –– –– STOCK UP NOW –– SAVE — Available In — 2-1/2 Gallon Container 5 Gallon Drum 30 Gallon Drum 55 Gallon Drum — BULK — 15W 40 Engine SWEEPS 10% OFF FREE BOLTS (10 OR MORE) IN STOCK FOR ALL CASE-IH CULTIVATORS gal. $ *Thanks! For Your Business!! ULTRA Genuine CASE-IH Blades — ALL BLADES ON SALE — 12 HYTRAN ULTRA 75 $ 6695 Hy-Tran Hydraulic $ 6995 DISC BLADES - Earth Metal - Blades in Stock For Most Makes - 15 W 40 Egine Oil 25 $ $ 25 12 gal. 5-Gallon Bucket Sale $$$ 15% OFF 10% OFF ALL PARTS OPEN HOUSE DAY EVERYTHING! -ALL PARTS - ALL MAKES *Refreshments Served All Day* Door Prize Drawing - 2pm Door Prize Drawing *Latest Equipment on Display *Company Representatives on hand BULK LUBRICANTS * FREE Delivery * *Bring in your containers – we will fill them *Available at both locations THIS WEEK *YANKTON STORE* THURSDAY MARCH 13 Bolts & Nuts * Grade 5 * Plated $2.75 * Up to 3/4x6 CASE-IH HP351 HEAVY DUTY GREASE TUBES - 10 PAK $3350 LB CASE-IH BATTERIES FARM SHOP TANK UNITS AVAILABLE WE INSTALL AND FILL (EXCHANGE PRICES) 10595 — DEF FLUID — * B2472 - HD GROUP 24 MANY APPLICATIONS $ IN STOCK — CONTAINERS — BARRELS — TOTES Also Totes and Pumps For Your Shop 275 GALLON TOTES - 55 GALLON DRUMS 7595 ALL BATTERIES ON SALE CAR-TRUCK-TRAILER BALER TWINE/NET WRAP IF YOU NEED TO GET SET UP WITH DEF FLUID FOR NEW TIER 4 UNITS SEE US - WE WILL HELP YOU DO IT RIGHT! All Types Sisal and Plastic - On Sale - COMBINE INSPECTION SPECIALS — PRECISION FARMING — • All Axial-Flow Mahcines• $299.00 Complete A 160-Point Inspection TRACTOR INSPECTION SPECIALS • All IH- Case IH Tractors• $199.00 Inspection Complete A 160-Point PROGRAM INCLUDES INSPECTION ESTIMATE, TRUCKING AND CLEANING EXAMPLES: $ * BMF31GW FITS ALL MAGNUM AND MAXXUM SEE: TOM KRONAIZL OUR GPS SPECIALIST FOR ALL YOUR PRECISION FARMING NEEDS *COMPLETE LINE OF CASE-IH/TRIMBLE PRODUCTS FOR PRECISION FARMING – GUIDANCE AND AUTO-STEER – PLANTER ROW SHUT OFFS AND PRESCRIPTION PLANTING – COMBINE AUTO STEER AND FIELD/YIELD MOISTURE MAPPING *SALE* SERVICE * INSTALL * TRAINING 16000 SISAL SPECIAL BUY - STOCK ON HAND ONLY $39.50 * ALL SIZES NET WRAP ON SALE* * 440 AND 350 PLASTIC FOR BIG SQUARE BALERS * PLASTIC TWINE FOR ROUND BALERS CASE-IH PLANTER PARTS OPENER DISCS W/ BEARING FITS 800 - 900 - 950 - 1200 PLANTER AND 5400 DRILLS ....$31.95 SALE PRICES ON ALL CASE-IH PLANTER PARTS BRING YOUR LIST! MARK’S MACHINERY, INC. 3211 E. Hwy 50 Yankton, SD MARK’S MACHINERY, INC. Phone: 605-665-4540 Toll Free: 800-526-8095 See what’s brewing on the job market. TWO LOCATIONS TO SERVE YOU BETTER LOCALLY OWNED SINCE 1972 745 E. Hwy 46 Wagner, SD Phone: 605-384-3681 MARK’S MACHINERY, INC. Toll Free: 800-693-1990 B ig Ch a n ges a re co m in g our to H a tch Fu rn itu re... We’re remodelingthe entire store with Help Wanted Section www.hatchfurniture.com FURNITURE &FLOORING 109 East Third, Yankton 605-665-4416 • 800-798-4663 M-F 10-6, Sat. 10-5, • Evenings by Appointment experience of a world famous designer. Come in now for 50% and more off furniture and accessories.